Chicken Cacciatore is a traditional Italian hunter-style chicken stew. Knorr Tomato Pronto creates the base authentic taste of this Italian recipe and we recommend finishing it with a touch of Knorr Chicken Seasoning for the perfect chicken flavor. Try out the recipe below today! Heat the oil in a large heavy-based saucepan over medium-high heat, cook the chicken, onion and garlic, stirring occasionally until brown and crisped. 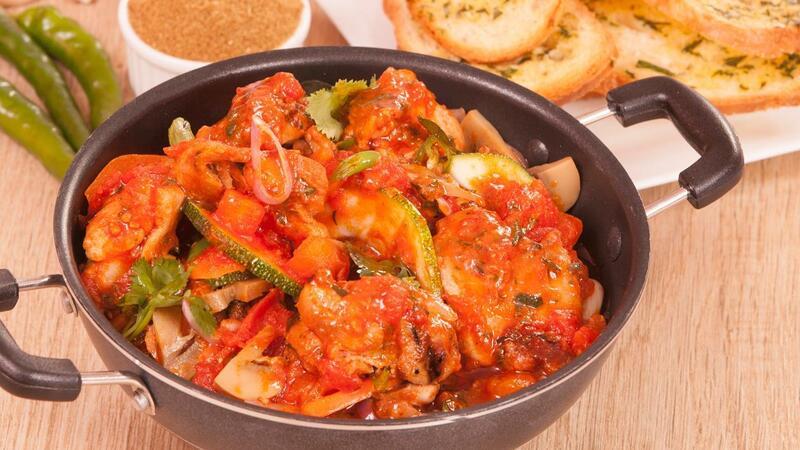 Add the wine and reduced to half; add Knorr Pronto Tomato, cumin, chillies and sliced vegetables; reduce heat to medium-low and cook, stirring occasionally by adding Knorr Chicken Seasoning Powder for few minutes or until the sauce thickens. Add the coriander, curry leaves and simmer stirring occasionally for another few minutes until the vegetables are tender; adjust pepper to taste. Serve with the garlic & herb bread.